Tomb Raider is an entirely decent film, not terrible, certainly not excellent, but fine. This, while being inoffensive does a great disservice to a character and potential franchise that held much promise given the real-world context of female empowerment in the wider film industry. Tomb Raider’s greatest shortcoming must be the fact that the filmmakers apparently did not trust a woman alone to successfully carry the film. Lara Croft (played admirably by Alicia Vikander) is surrounded by multiple father figures and assorted male “back-up” characters to the extent that her individuality is left diluted by the wide selection of irrelevant men that surround her. It is also disappointing that this female-led action film is virtually devoid of its own female with the titular hero having little to no narrative authority. Lara’s latest tomb-raiding quest sees her following an intricate trail of clues in her long-lost father’s research as part of her quest to reunite with him. This quest, which dictates the course of the film, is almost entirely narrated by Lara’s father (Dominic West) as his flashbacks, voice overs and video recordings take up as much, if not more, screen time than Lara herself. Thus, one of popular culture’s most famous female action heroes is literally denied a voice in her own film. Tomb Raider is at its most commendable in its action sequences, particularly in its showcasing of its lead character’s hand-to-hand combat skills. The film opens on Lara, mid-sparring session, in the boxing club where she trains. In this scene both women’s bodies are glorified for their sheer physical prowess. We are never ogling scantily clad, hyper-sexualised women. We are swept up in their combat and encouraged to marvel at their strength and agility. This entirely appropriate yet startlingly still refreshing treatment of the female body in action cinema cannot be underestimated in its value and deserves due credit. It would have been nice if this film had started as it meant to continue in this vein of “girl power” (for want of a better term). Director Roar Uthaug instead reverts all too quickly to the unfortunately familiar dynamic of good woman versus bad woman. Ultimately, while this film is not bad, Lara Croft deserves better. 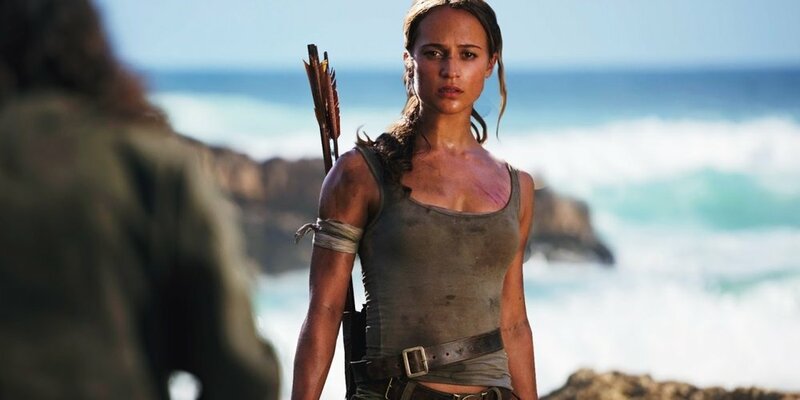 Instead of rejuvenating the franchise Tomb Raider presents a decidedly average rehash of Indiana Jones and the Last Crusade that is fronted by, but most certainly not centred on, a woman.